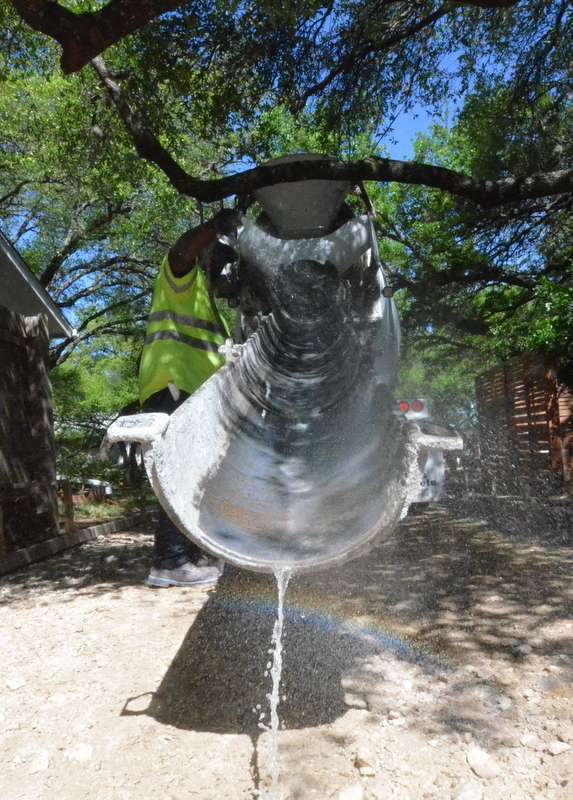 The first concrete mixer is scheduled for noon. The team from Gilsa arrives at 8 am to prepare. 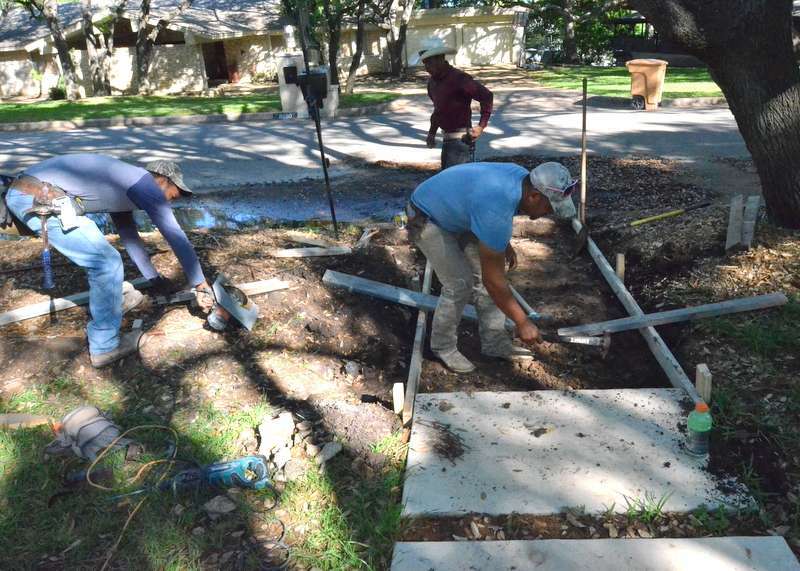 Digging out and forming up for the two pavers that will extend the front walk to the street — after removing the old pebbled concrete fan from another era. 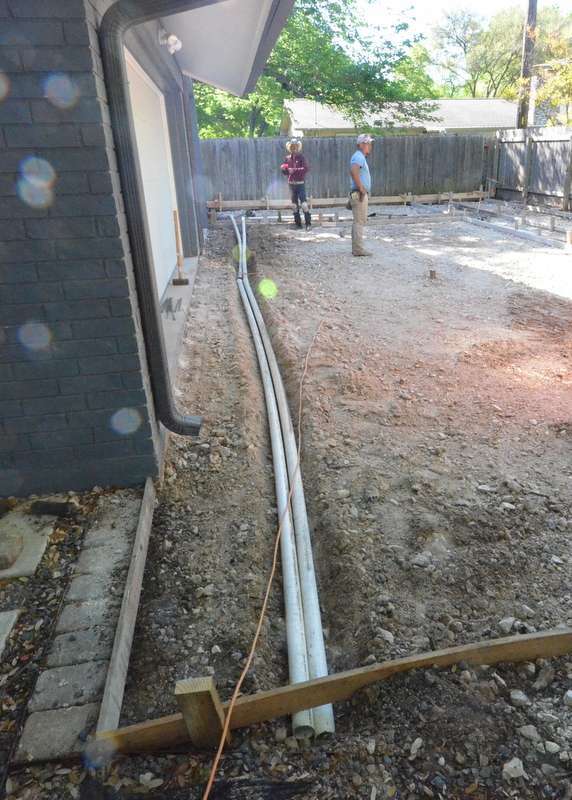 The roadbase in front of the garage doors is trenched for emplacement of conduit and pull lines — planning ahead to ensure we have the ability to pull electrical cable under the new driveway slab from the electrical box at the back of the garage. 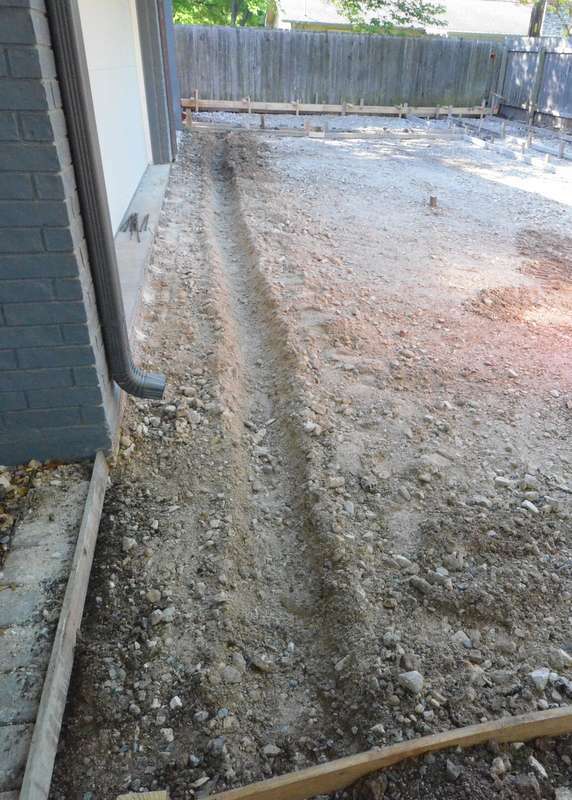 At the back corner of the garage, two conduit runs travel to the front of the garage, and one travels across the roadbed to what will be the opposite side of the new driveway. Mauricio from Gilsa, left, supervises. 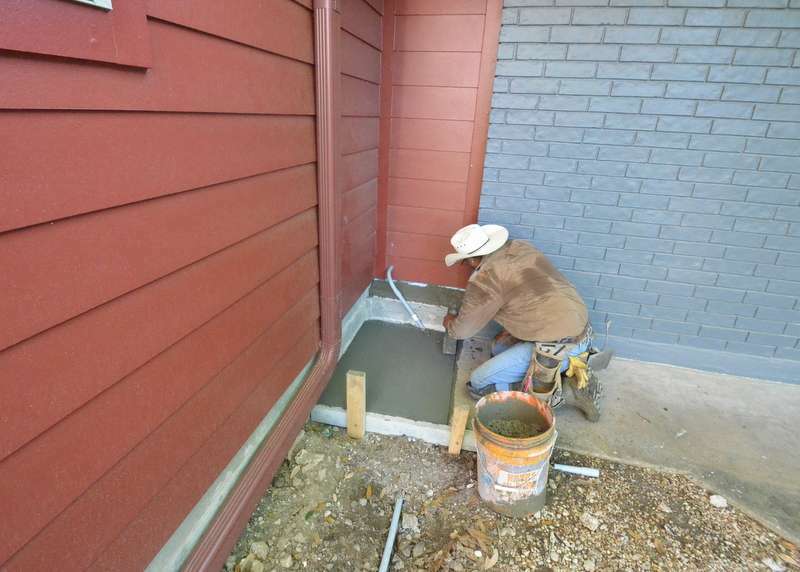 The two conduit runs emplaced in the trench across the garage doors. 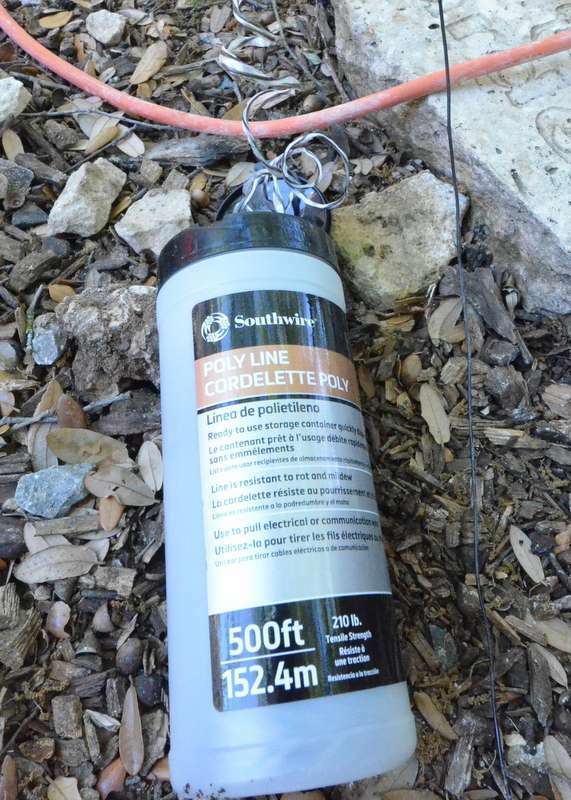 Gilsa ran this pull cord through the conduit runs. One of the things we learned trying to pull electrical cable through conduit is to use larger-radius turns in the conduit. 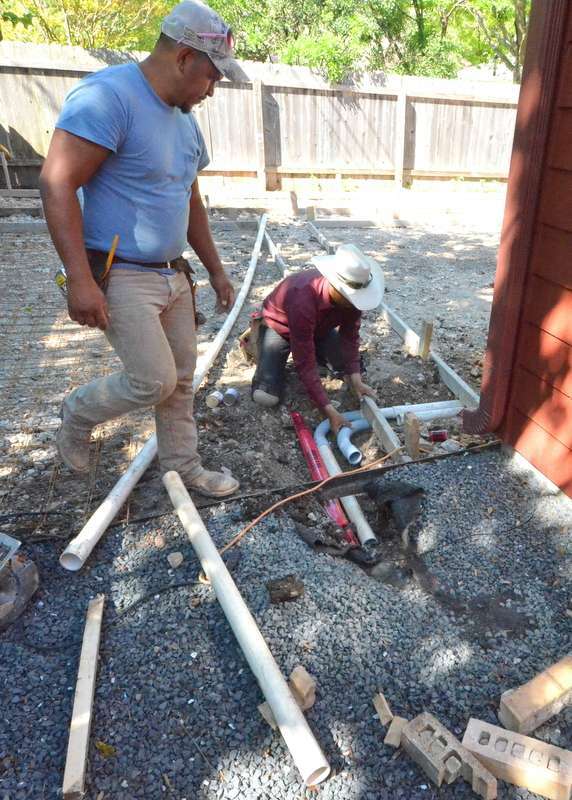 Stiff electrical wire does not turn tight 90-degree angles. The first mixer is backed up as far as the oak trees will permit. Spraying the discharge chute at the back of the mixer to ensure the cement does not bind to the chute. 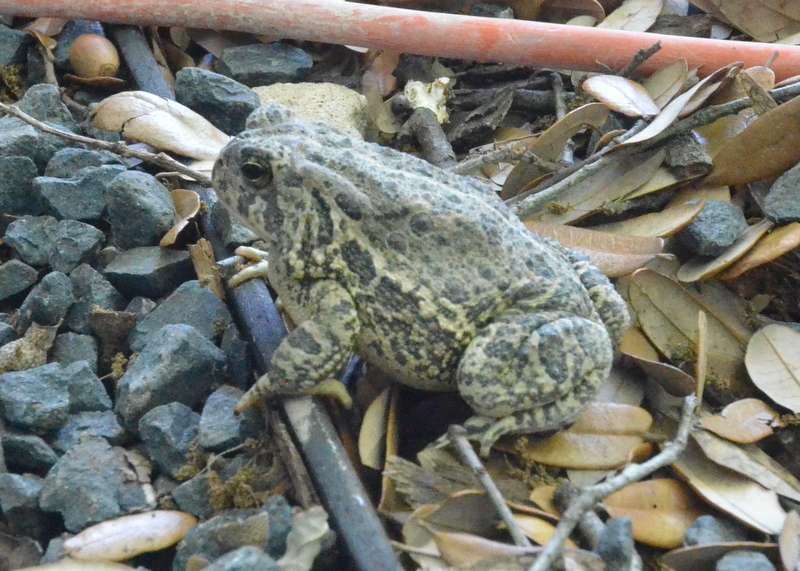 This toad came to inspect the job site. 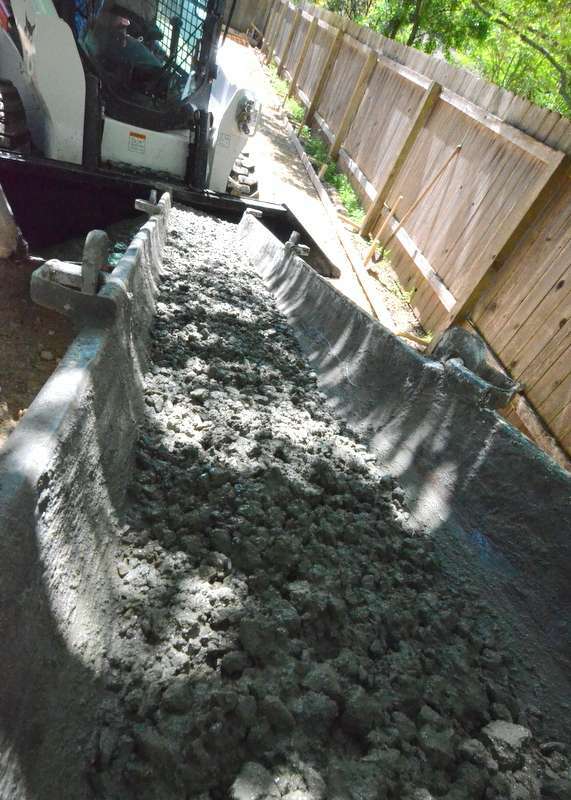 The first load of concrete travels down the discharge chute into the maw of the Bobcat. 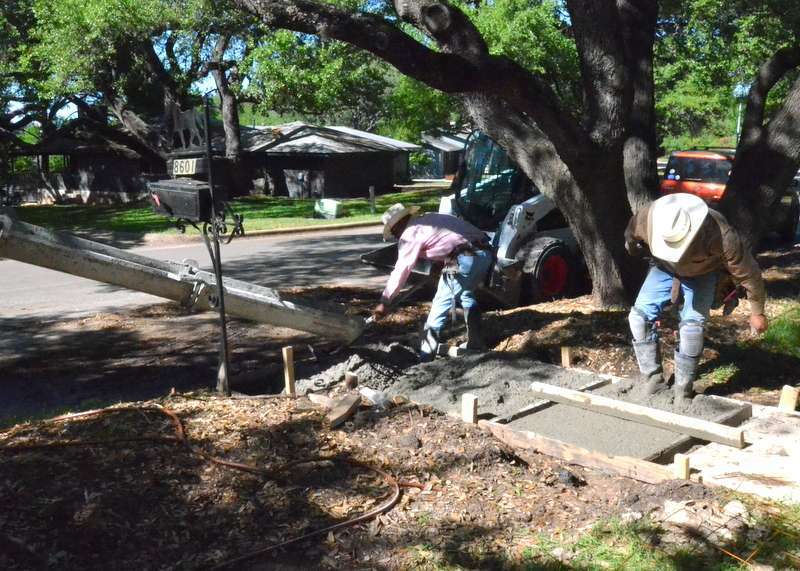 The Bobcat dumps the first load of concrete. And the ballet begins. 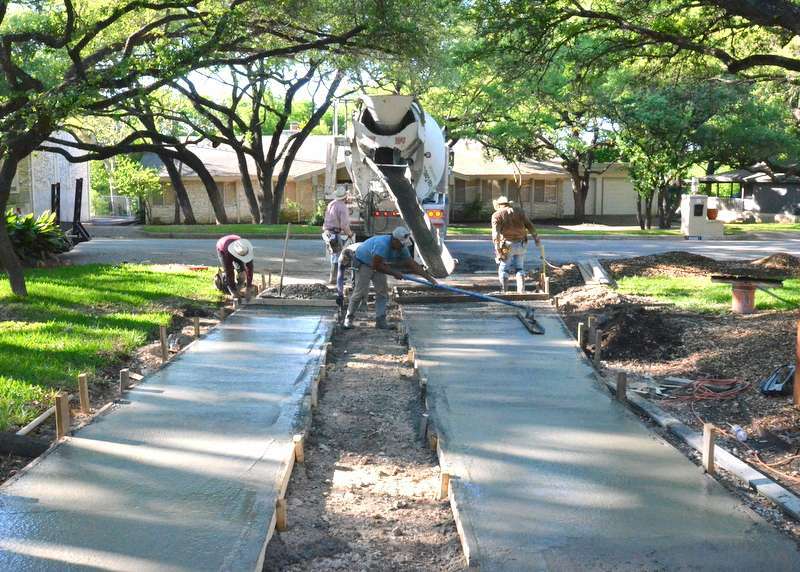 Flinging concrete at the form for the curb at the top of the driveway. 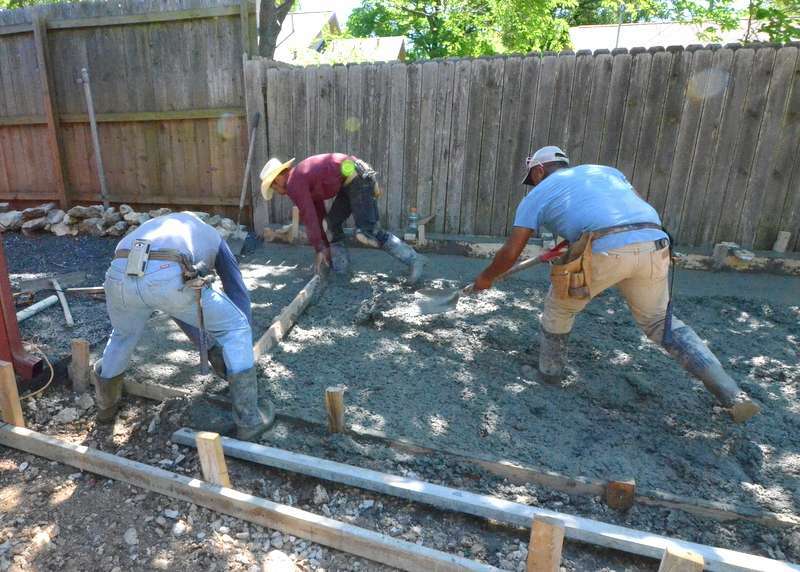 Leveling the new concrete to grade. 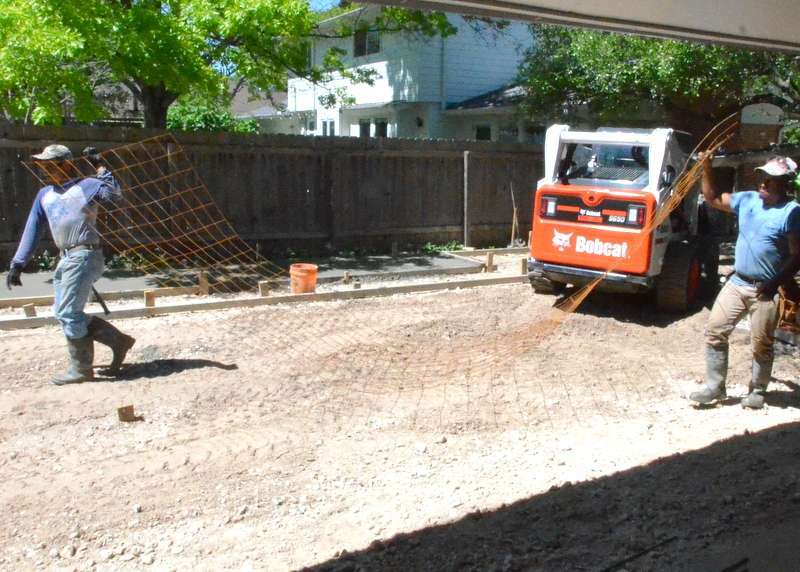 Pounding rebar into the garage slab to join the slab to the new driveway. Porting the steel mesh into place that will reinforce the concrete. 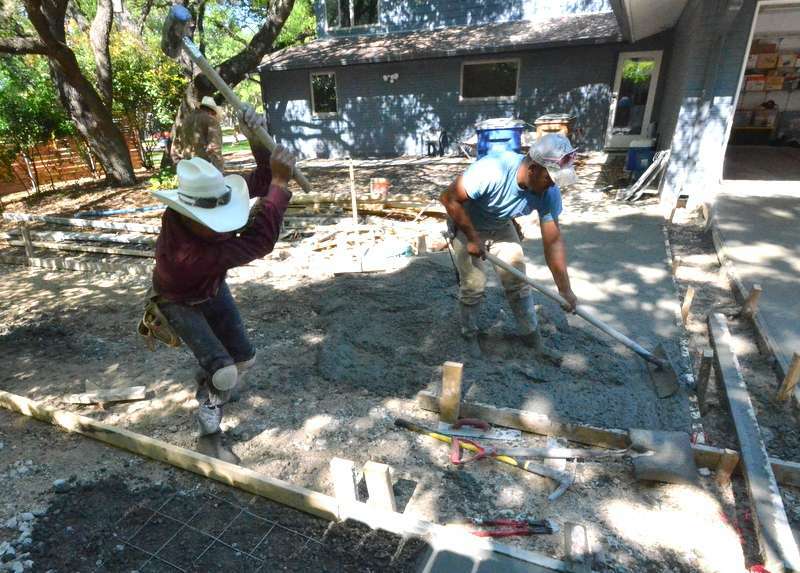 The ballet continues, with float and shovel. 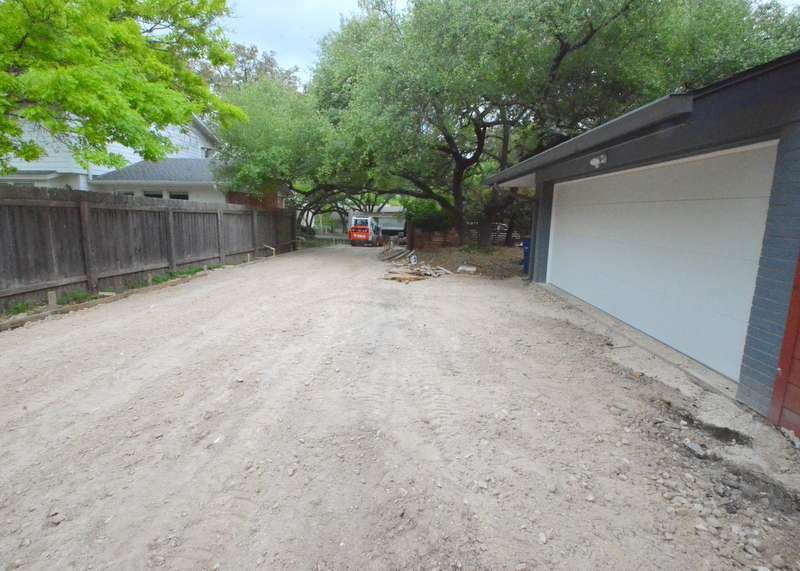 At the head of the driveway, near the street, this is the cleanout to the main waste line that connects the house to the sewer system at the street. Very important to protect. 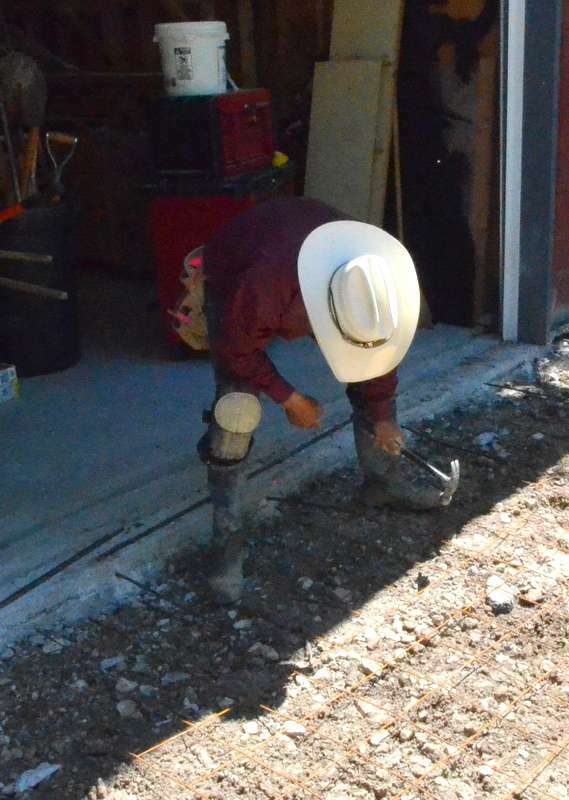 Pounding a stake into place to brace a form. A long view down the driveway, with the shape of the ribbons beginning to emerge — while carrying a lumber form into position. 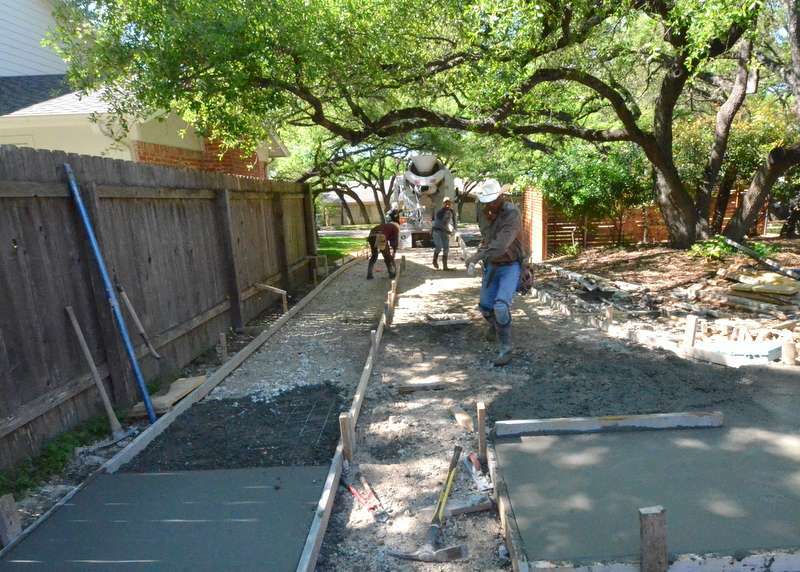 Pouring concrete into the forms for the extension of the front walk. 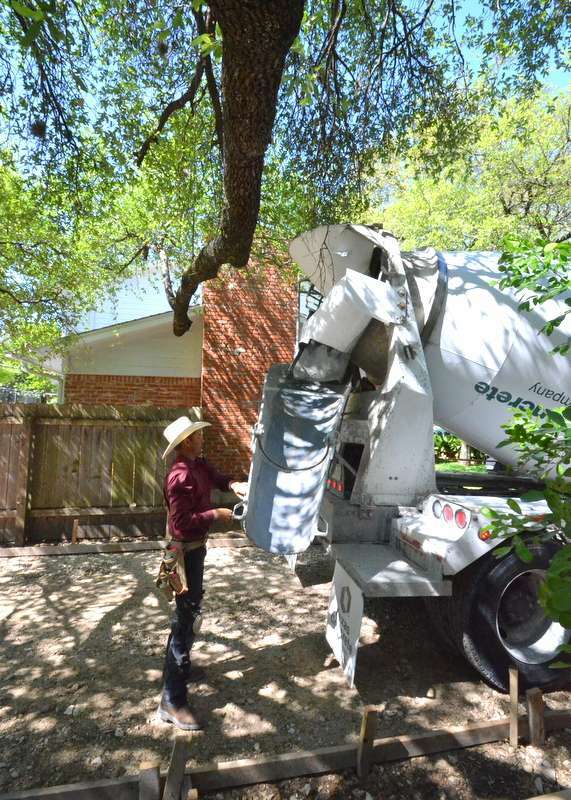 Alejandro signs the delivery receipt for the second cement mixer. 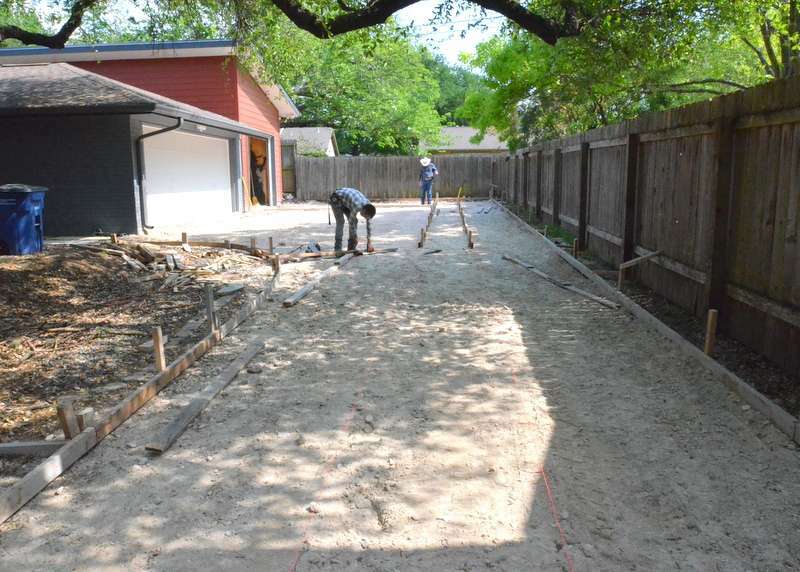 Finishing one of the pads in front of the two-car garage. 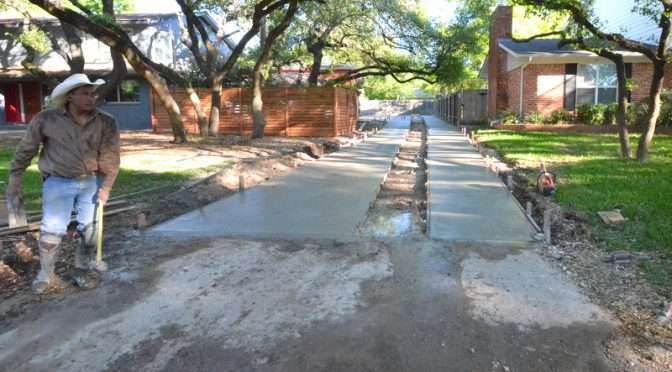 The front walk, extended to the street from the front of the house. 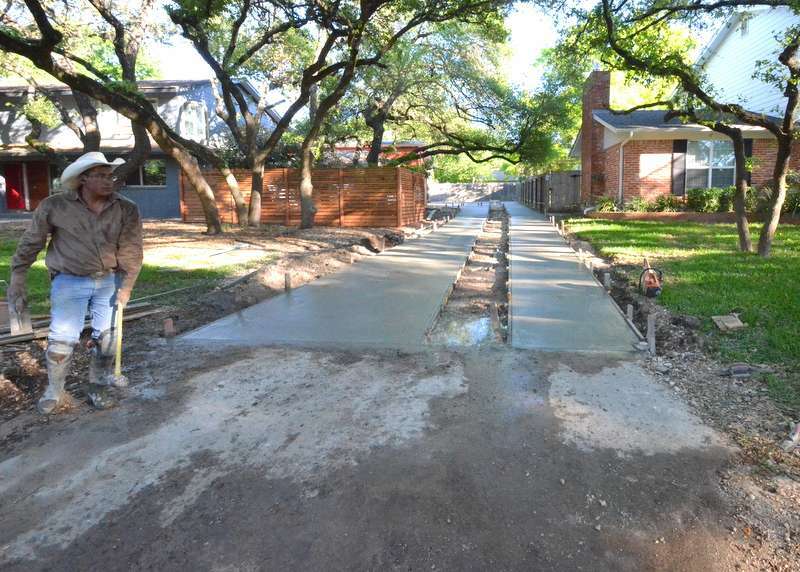 Looking down the driveway toward the street, with both concrete ribbons nearly complete. 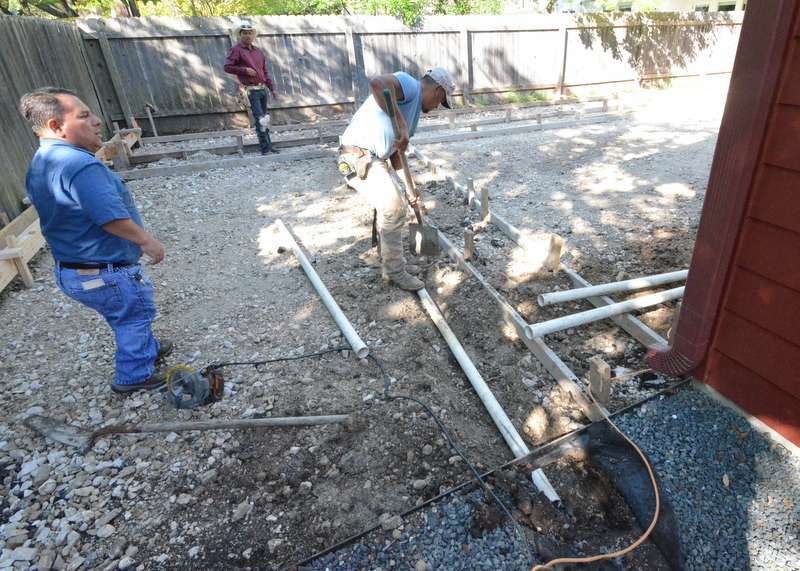 At the back of the garage, the missing slab is formed, with the conduit for the sprinkler control line embedded — one more punch-list item taken off the to-do list. And done. The view from the street, looking toward the top of the driveway. 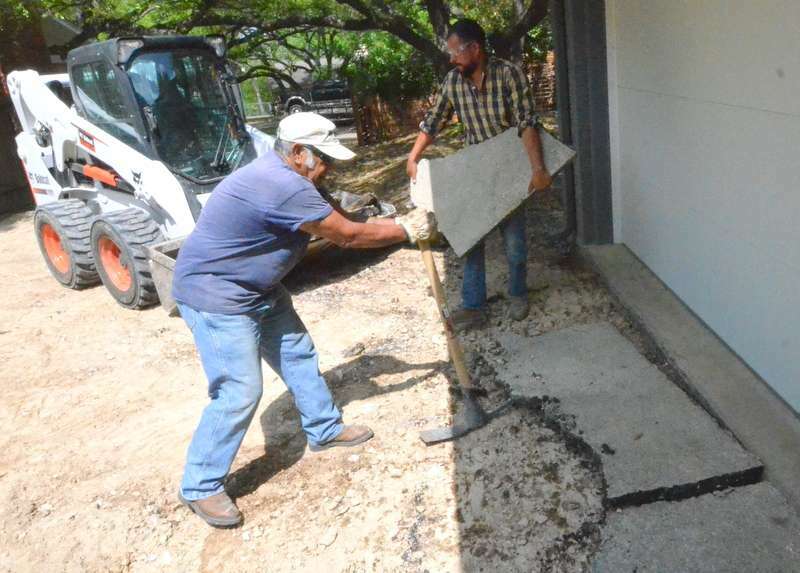 Steven met at the landscaping yard with Mauricio from Gilsa Construction to pick out the rock to use in the drainage channel down the center of the new concrete driveway. 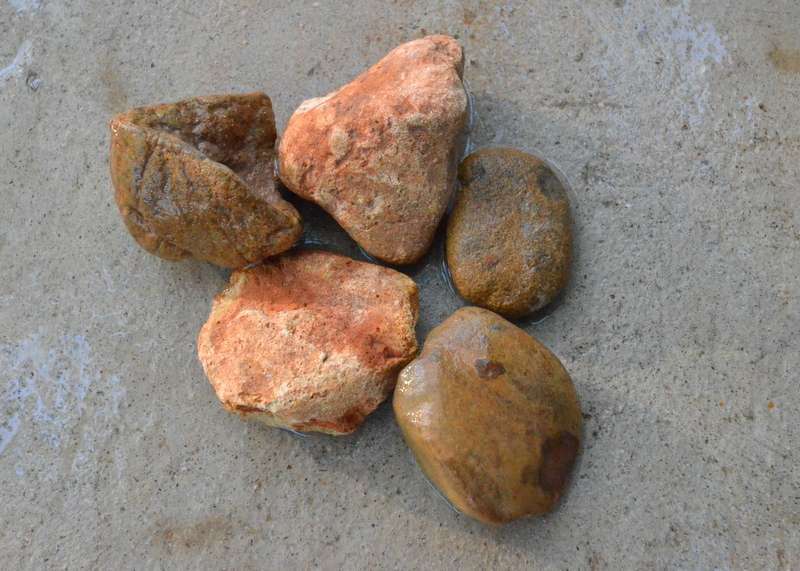 We picked a “Santa Fe” mix of reds, grays and browns, 1-3 inches. The colors will complement the red cedar privacy fence at the front of the house, and the gray paint on the body of the house. 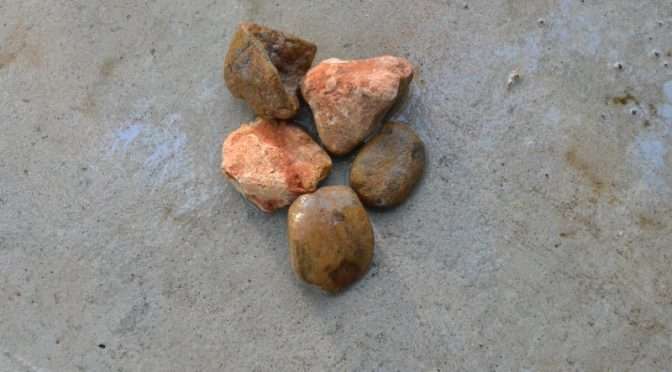 The size should be large enough to not shift when rainwater travels across the rock. And … Steven asked Jacquela to marry him while visiting Santa Fe and Taos. So … the Santa Fe mix is an easy decision. 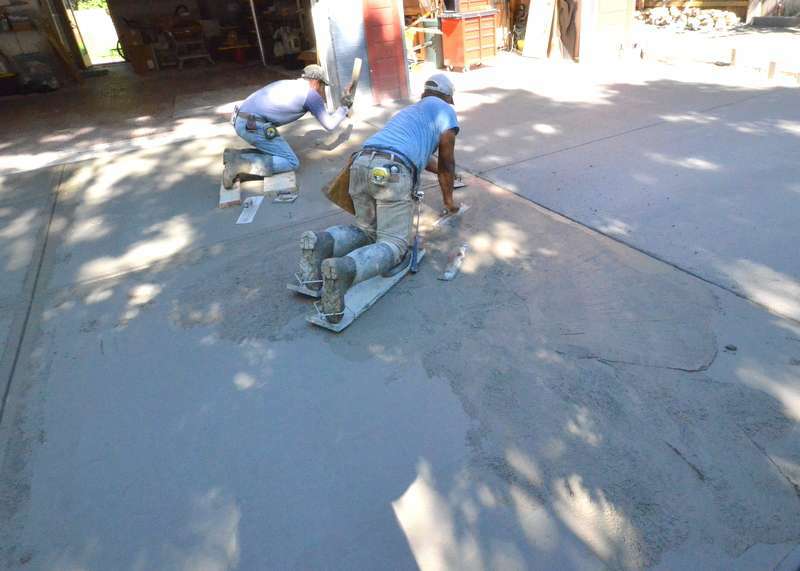 A close-up on the Santa Fe sample mix, wet, against gray concrete. 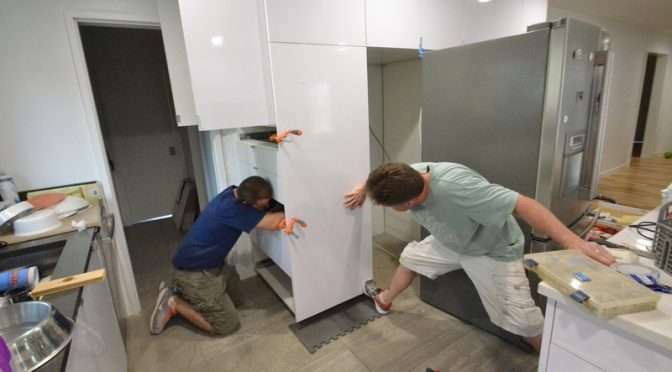 Bahne and Aaron from Central Texas Custom Cabinets kicked out the near-final punch-list repairs on the kitchen cabinets. There’s one last corner to patch. This gives you an idea of how much muscle, art and toolwork is required just to screw an end panel correctly into place. 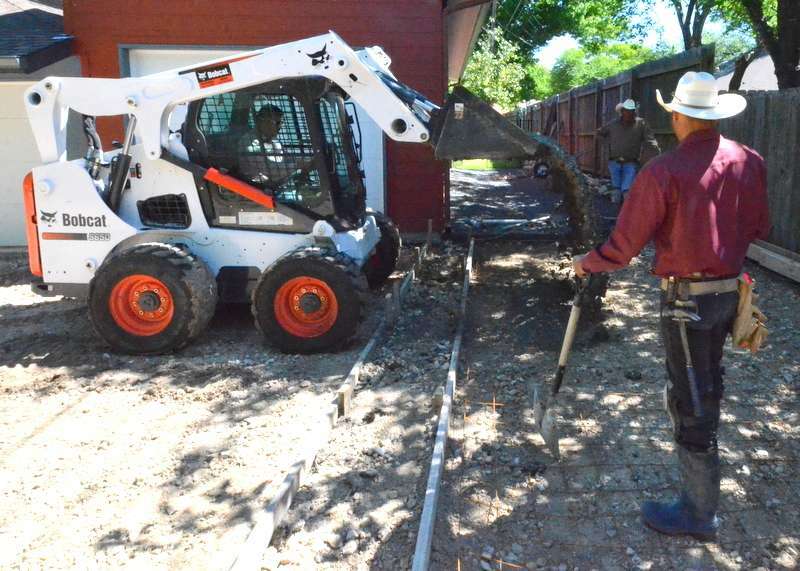 Alejandro and Juan from Gilsa Construction arrived to regrade the roadbed, prepping it for concrete — and to build the lumber forms. 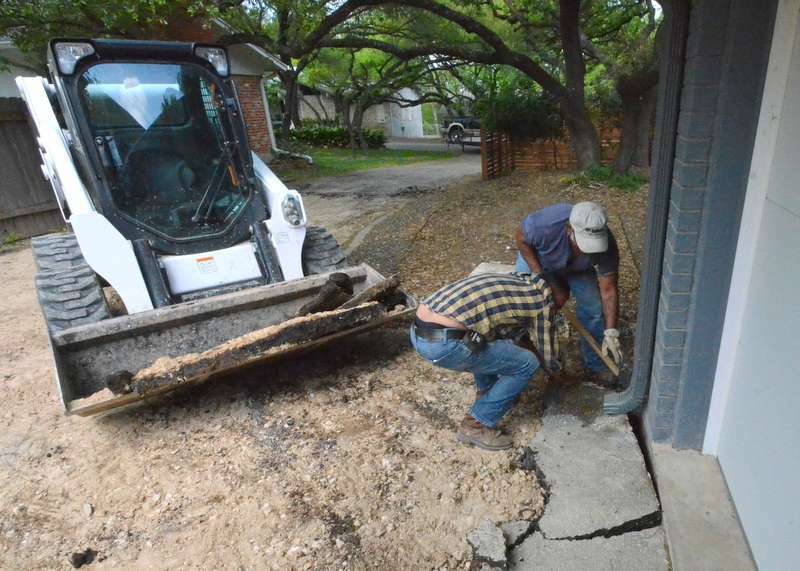 Alejandro works the scoop on the Bobcat down the long run of driveway to the street. The chunks of asphalt rubble get loaded into the dump truck. The truck took two loads away. 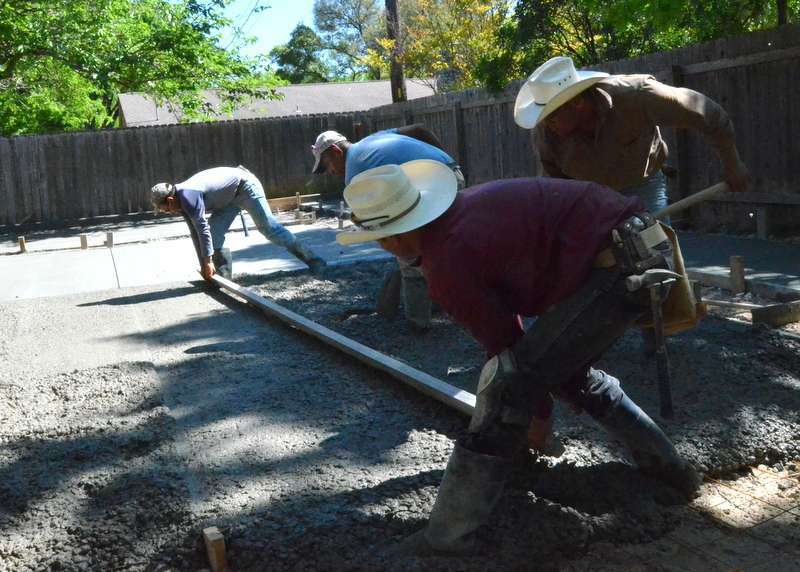 Juan, front, and Alejandro, back, sledgehammer the forms and braces into the roadbed. 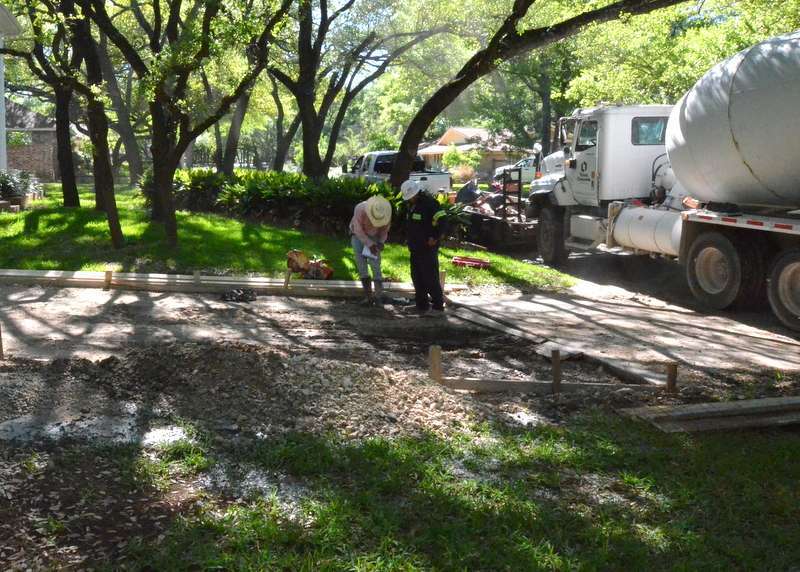 There will be a rock channel down the center of the driveway to collect water and carry it from the back of the driveway all the way to the street, with the ability for water to percolate into the ground to feed the oaks — and to reduce impervious cover. We’ve been in the house for a year. 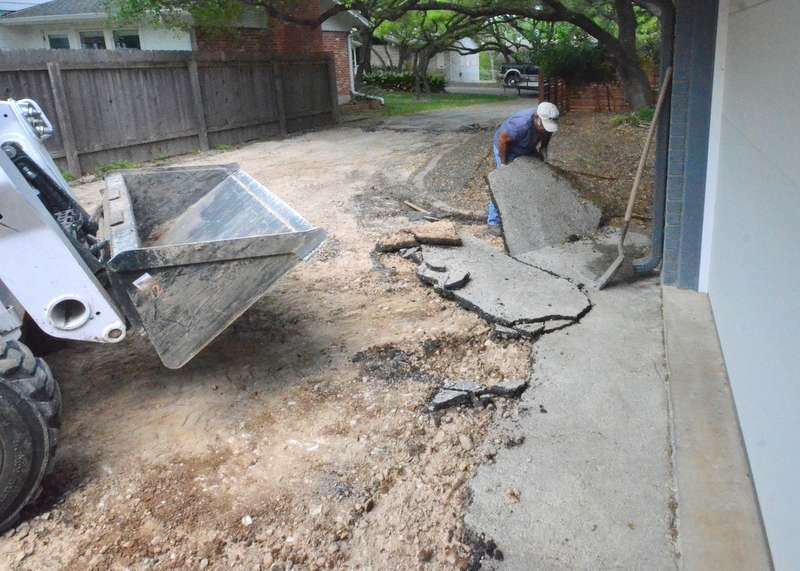 It’s time to rip up the asphalt driveway and replace it with concrete. 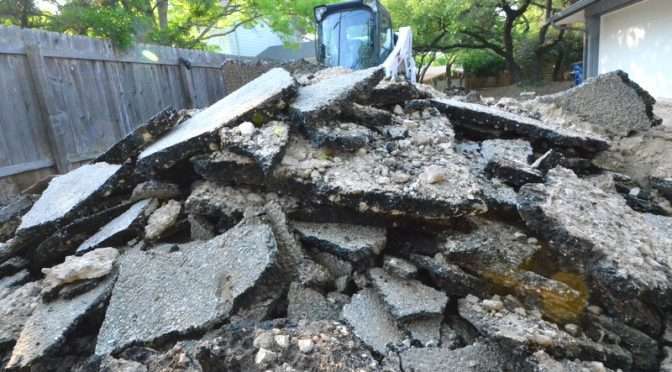 Construction and dumpsters damaged a 50-foot-long section of the driveway. 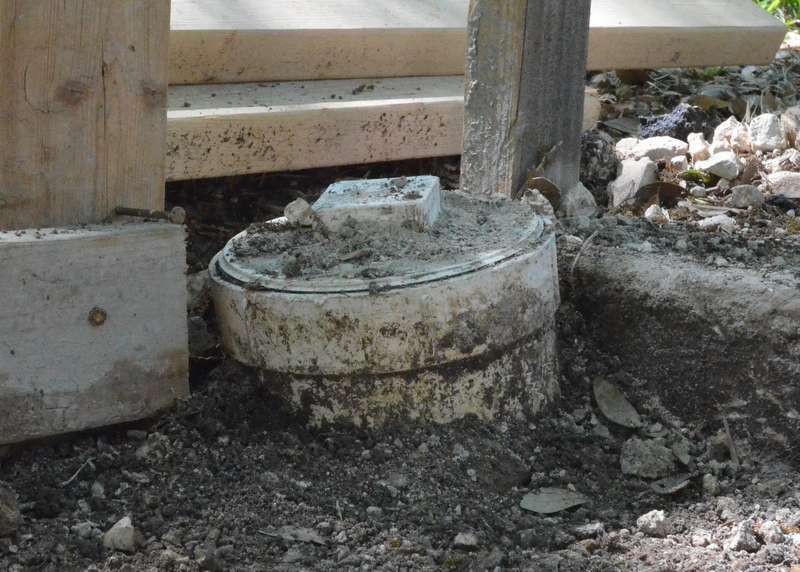 Erosion and rainwater undermined a section closest to the kitchen. 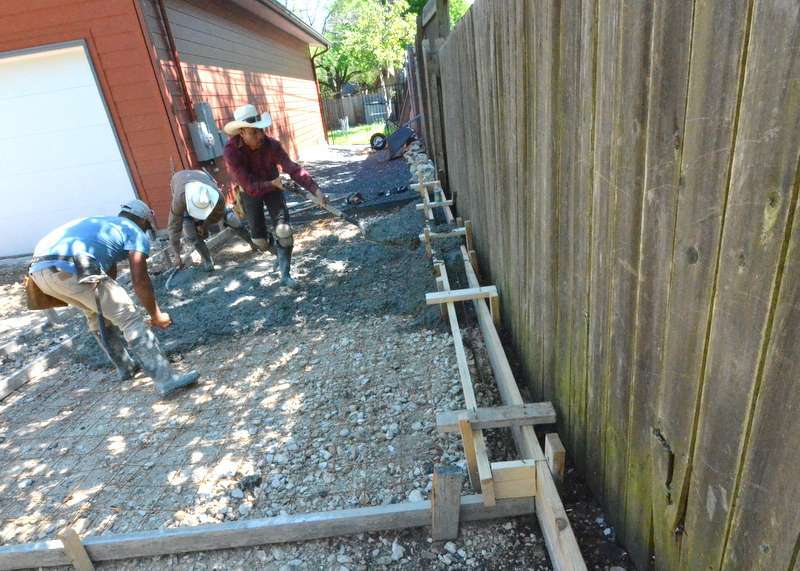 At the back fence, water travels across the driveway whenever it rains, whenever the backyard neighbors switch on their sprinklers, carrying debris and building an alluvial fan of sediment that travels all the way to the curb at the front of the house. 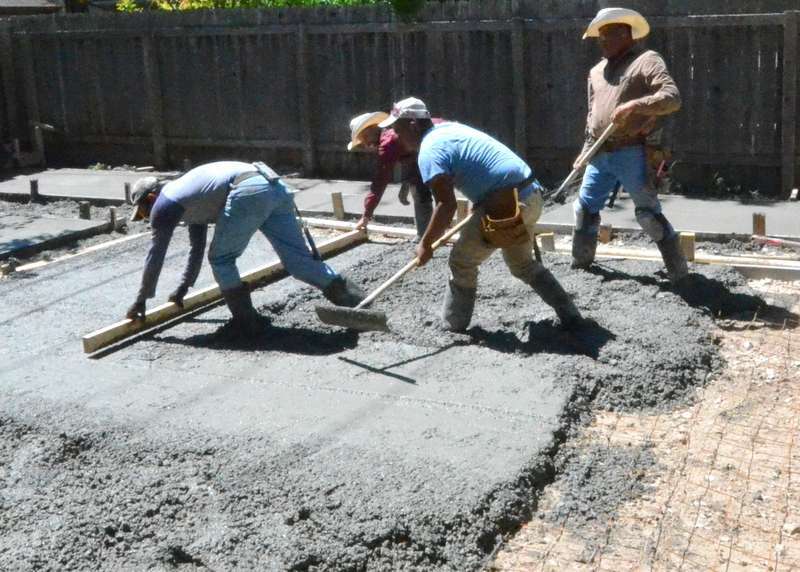 Steven called Mauricio at Gilsa Construction, which did the concrete work on the house. They reached agreement on budget. 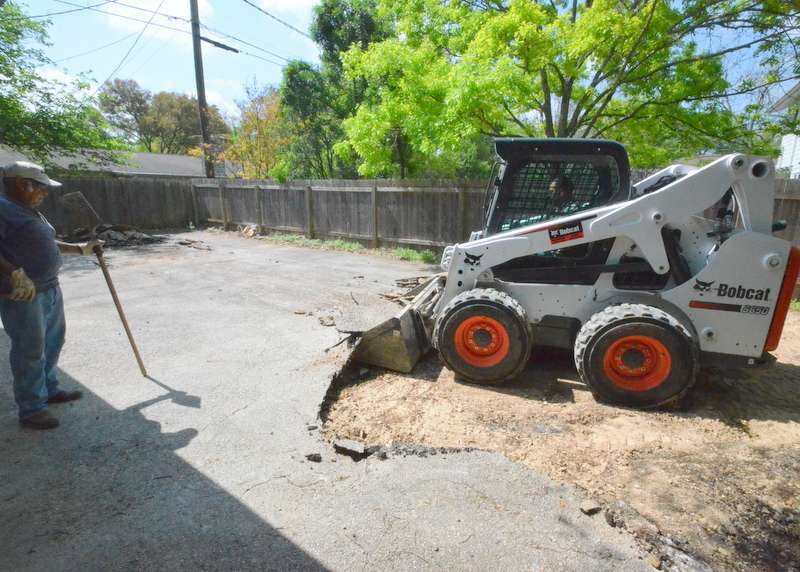 Work begins by ripping up the asphalt with a Bobcat. Netto is driving. Manuel is shoveling. 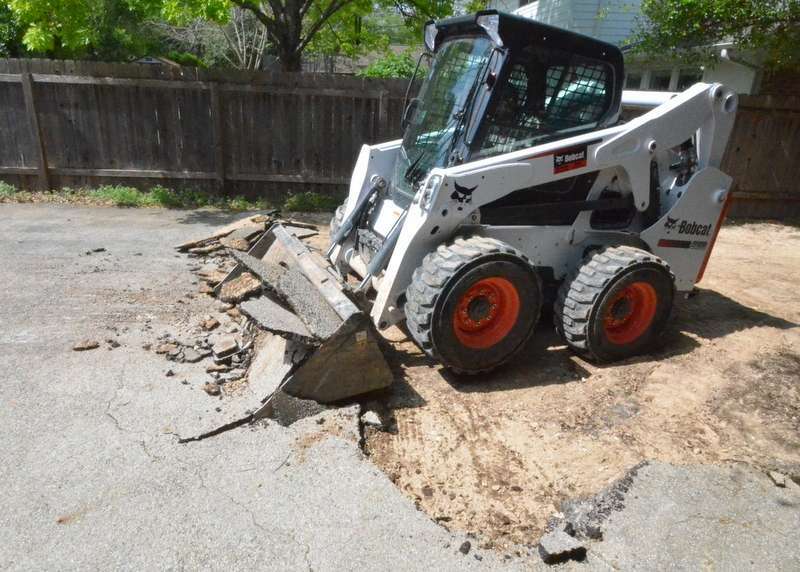 The Bobcat blade rips through the asphalt. First discovery — the asphalt comes up quickly and is brittle with age; we guess it is at least 30 years old. 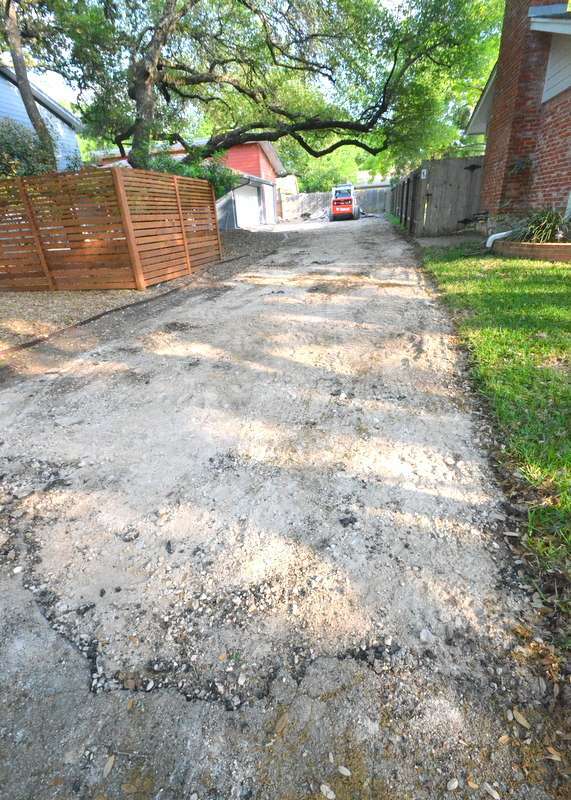 Second discovery — the roadbase under the asphalt is in really good shape and does not need to be replaced. 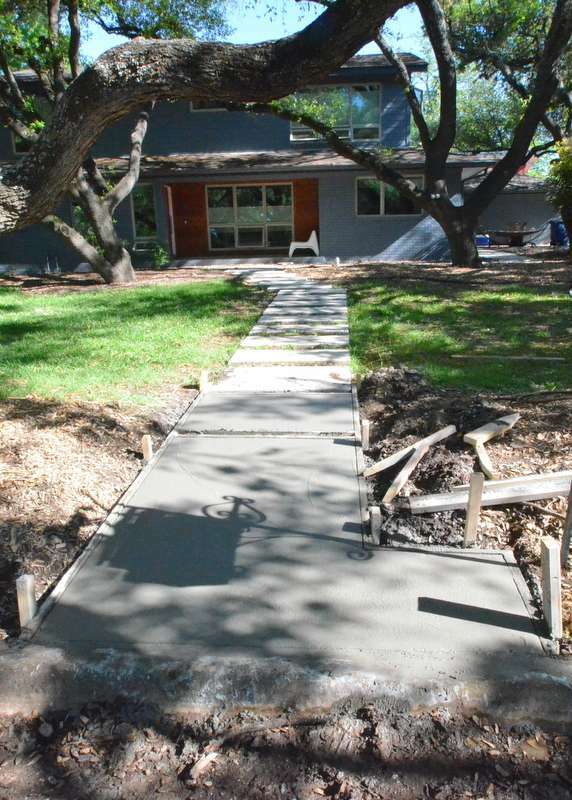 Instead, Gilsa will be able to easily regrade it to push water away from the house. 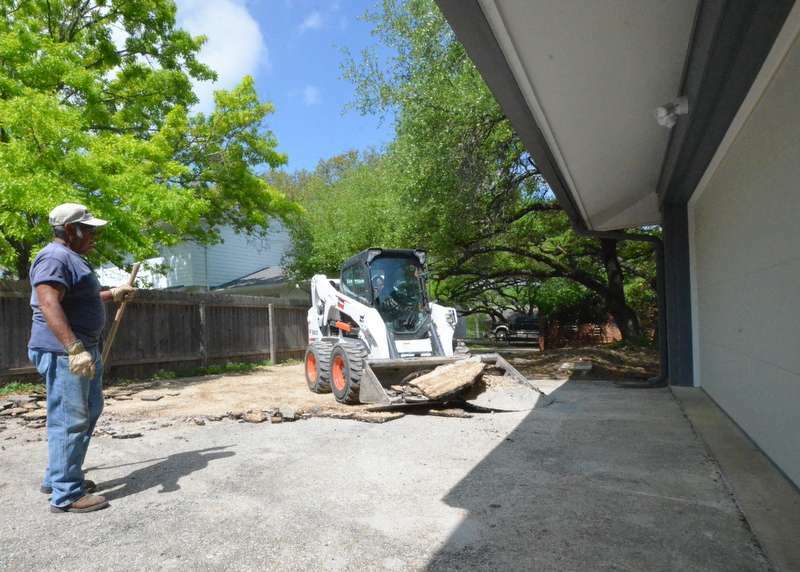 Netto moves the Bobcat into the field opposite the garage doors. The asphalt continues to come up easily, brittle, even when warmed up in the sunlight. 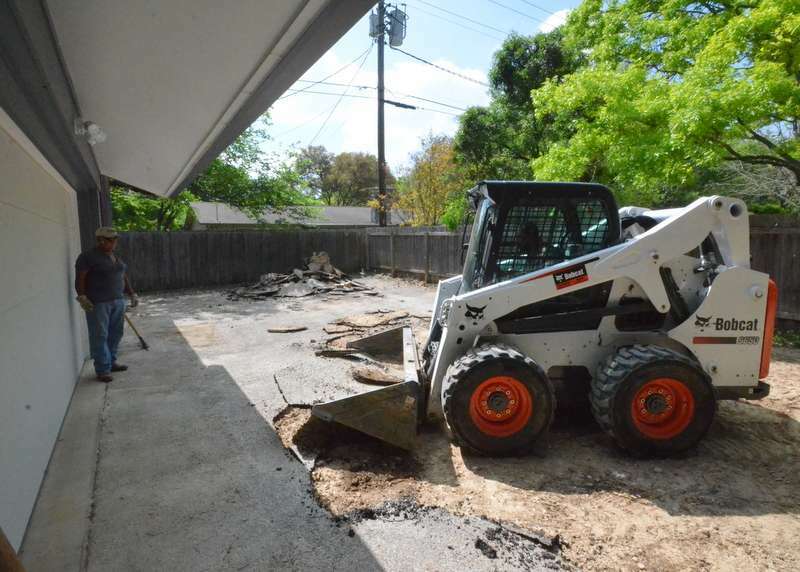 More big chunks as Netto moves toward the garage doors. 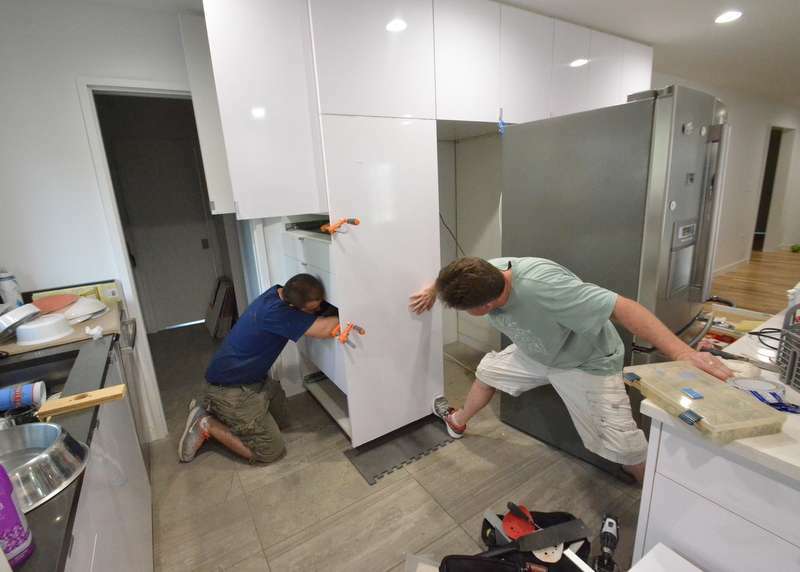 This is almost as close as Netto will bring the Bobcat to the garage. After this, Netto and Manuel switch out to pick and shovel. 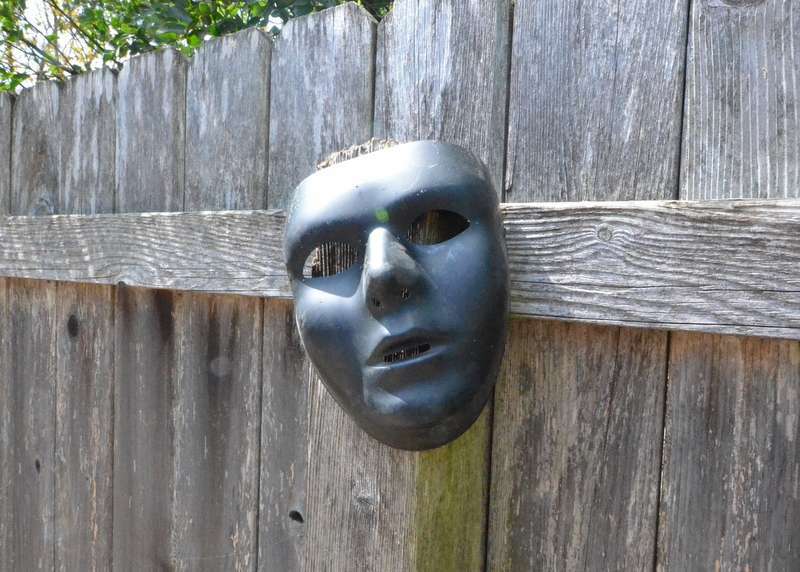 Manuel discovered this mask buried in the dirt between the driveway and the neighbor’s fence. Manuel wrestles a chunk of asphalt by hand. Netto drives the Bobcat closer to load the asphalt. 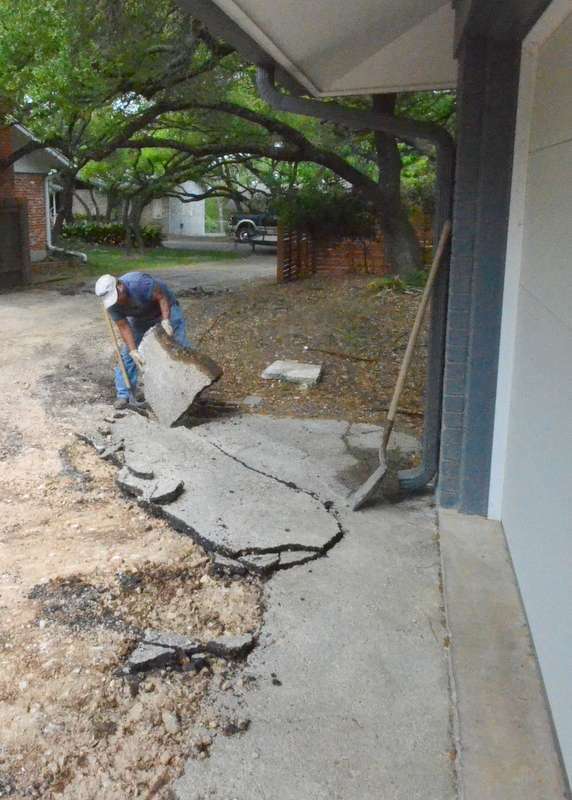 Netto, left, and Manuel wrangle a chunk of asphalt away from the garage slab. This work builds muscle. 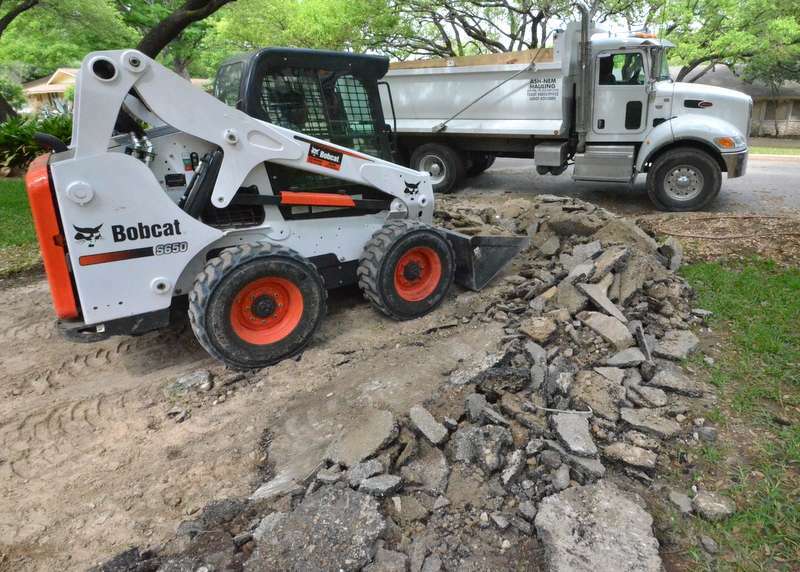 Manual lifts a chunk of asphalt with a pick while Netto carries a section to the Bobcat. 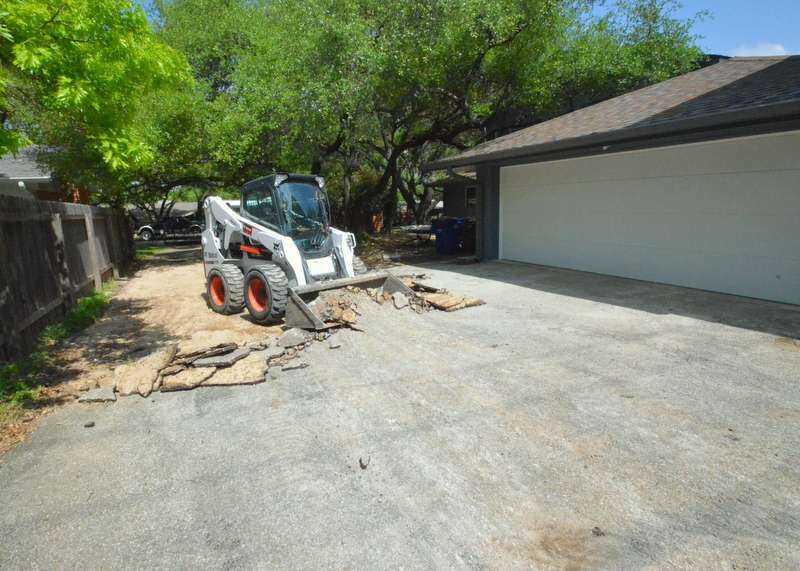 Near the end of the day, Netto parks the Bobcat at the end of the driveway. 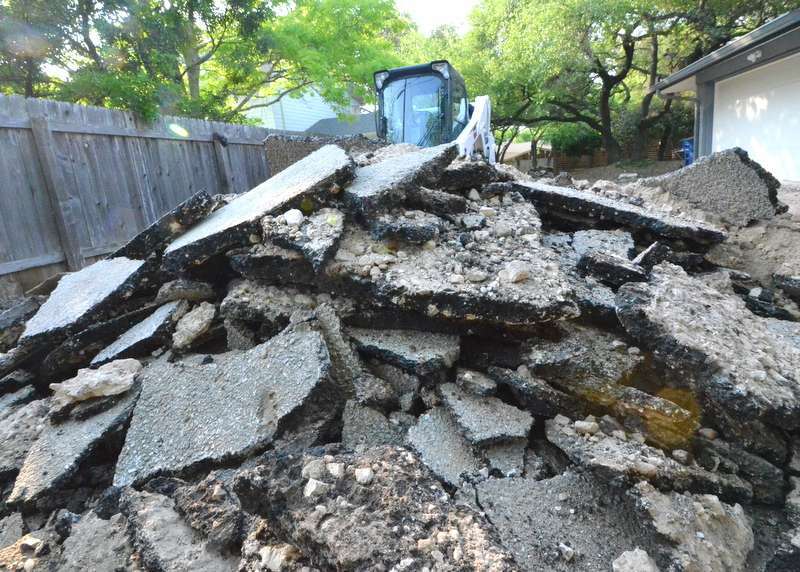 A pile of asphalt rubble at the end of the day. 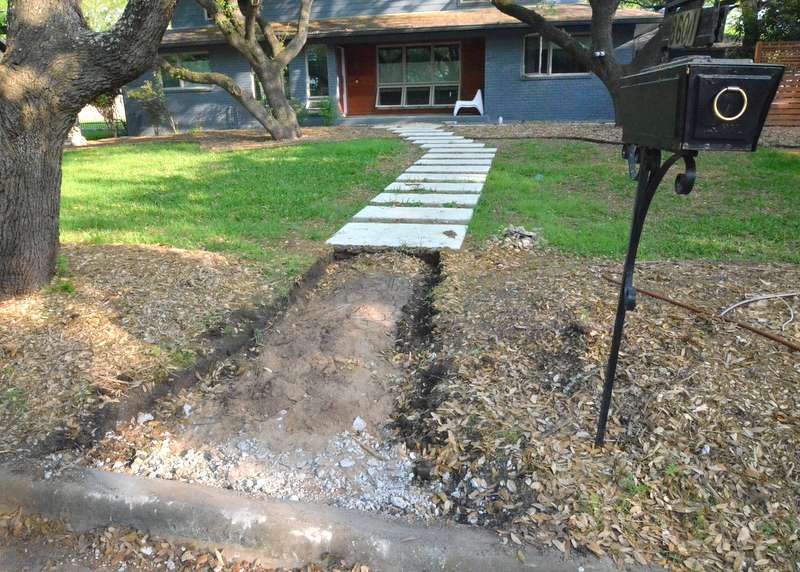 Since we’re pouring a new concrete driveway, we’re also going to rip out the last section of the ugly old original pebbled walk from the front door to the street.